A comparison between the planets Mars and Earth. Mars is not the closet planet to Earth but it is the one that looks the most Earth like. It is around 80 million kilometers further out from the Sun than Earth, circling in its orbit at 228million kilometers, or about 1.5 AU. The image shows a scale model of the distance. Mars is much smaller than the Earth. But, as Mars has no oceans, it actually has the same land area as Earth. Also, Mars has a tilt very much similar to Earth, sometimes it leans towards the Sun and sometimes away. As on Earth, the tilt causes Mars to have seasons, times when its warmer and colder than normal. 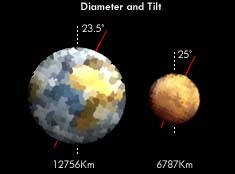 The image shows the relative size difference and the angle each is tilted by. Mars is much colder than Earth. At night tempertures can drop to -120 degrees centigrade below zero, but during the day in the middle of the Martian Summer the temperature can reach a comfortable 20 degrees, but only just. The image shows the temperature range in degrees centigrade for both Mars and Earth. Because Mars is so much smaller than Earth, the speed you need to reach to esacpe from its gravity is much smaller. This means its much easier to escape from Mars than it is from Earth so a rocket on Mars would not need as much fuel and could be much smaller than those here on Earth. 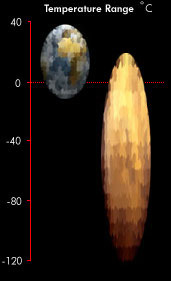 The image shows two speedometers and the speed in meters a second you would have to reach to escape each planet. Some reasons to go to Mars.